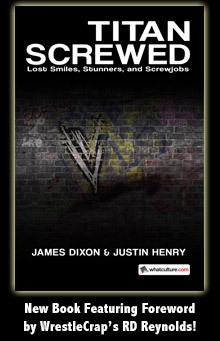 Headlies: Vince McMahon Coming Around To The Idea Of Japan - WrestleCrap - The Very Worst of Pro Wrestling! Stamford, CT – After many years of self-reflection and the strong efforts of his staff and family, WWE CEO Vince McMahon is finally coming around to the idea of Japan. McMahon, whose strength is not in geography, had been unable to grasp that concept that Japan was, in fact, a real country with it’s own language and culture. Thanks to the signing of NXT star Hideo Itami and the appearance of legendary Japanese wrestler Jushin “Thunder” Liger at the upcoming NXT Takeover, WWE COO Triple H was finally able to break through to McMahon. “Itami and Liger are really going to help the WWE reach a brand new fan demographic in Japan,” Triple H said. McMahon furrowed his brow in confusion. “Jah-pan?” said Vince, struggling with the word. 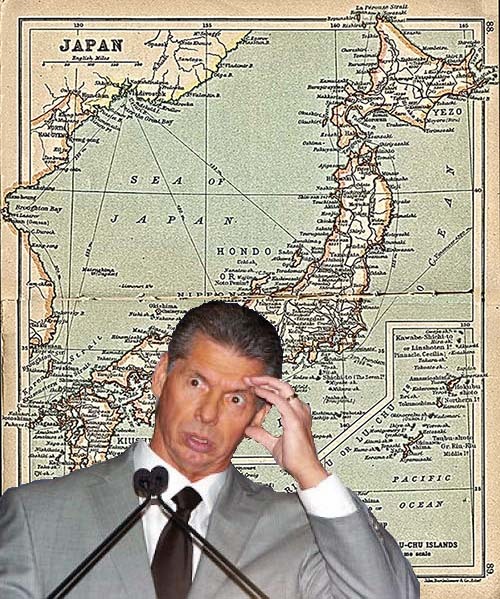 After several hours and with the aid of a globe, multiple maps, and a Where’s Waldo book, Vince McMahon finally began to accept the fact that Japan exists. Unfortunately, now all wrestlers in developmental are listed as being from Japan, Massachussetts. 18 Responses to "Headlies: Vince McMahon Coming Around To The Idea Of Japan"
So that explains “Japanese” Superstars like Yokozuna, Kato & Kwang and so many more that hailed from Tokyo, Japan. Sometimes Vince can’t remember what happened on the show two weeks ago it seems though. Don’t forget Jinzei Shinsaki (Hakushi). I started enjoying this from the pic…and the article just got better. Things were later confused when at a later press conference to announce a Japan-related RAW, Vince McMahon announced its guest host would be “Commodore Matthew Perry”, as he called him, This confused the actor’s agent as he later stated that he had yet to receive any sort of request from the wrestling company, as well as WWE staff who wondered why he kept calling Mr. Perry “Commodore” despite the man having never served in the navy. As someone who has done many Photoshop’s over the years, this is truly is a gem and should be a magazine/newspaper cover somewhere immediately! No one better not let McMahon see Hogan’s time over there while he represented WWF. It would only result in McMahon becoming so enraged that Japan would become the new WCW in his eyes. Many indy wrestling offices in Japan do weekend shows, monthly shows, or as in the case of Dradition or RJPW, 2-3 months in between. The bigger offices will do a tour every month for a couple of weeks and even then have a day or two break during the tour. Vinny Mac loves having his guys on the road 300 days a year, wear them down, break them and then replace them. The Japanese system is better. Liger has 30 years in the ring, Tatsumi Fujinami is 60 and still able to go. The Original Tiger Mask still gets in the ring, Masanobu Fuchi still works prelim matches. The guys in Japan generally avoid the bodybuilder look but have more longevity.. My favorite wreslter is Osamu Nishimura. His body looks average but he can still bridge like crazy and has great technical skill. The bad news is that Vince has also discovered a new country called North Korea who have a leader with a silly haircut.